Data Center Stocks: Is it Time to Sell F5? Few stocks have performed like F5 (FFIV) over the last year. It's risen over 150% the last 12 months, while NASDAQ has eeked out a 9% gain, and rival Cisco (CSCO) has fallen 5%. Its other chief competitor, Citrix (CTXS), has risen just 71%, less than half as much as F5, renewing calls that the stock is overvalued, and ready for a fall. F5's rise over the last few years has climbed a wall of worry. When it hit $26 in April 2009, UBS downgraded it citing valuation concerns. Since then, the stock has risen more than three-fold. Moreover, the fundamentals have remained very strong, with top line growth exceeding 40%, the cash balance growing and nearing $900 million, negligible long-term debt, a workforce that produces nearly 50% more revenue per head than rival Citrix, and Cisco (CSCO) still struggling to find its way in the load balancing market. 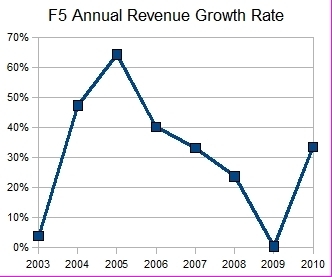 Between 2000 and 2003, F5's annual revenue was essentially flat, bouncing around between $108 million and $116 million. Since then, it's grown eight-fold, with last quarter's revenue coming in at $230 million. With the exception of 2009, when it grew just 0.5% due to the recession, the company's top line growth has come in anywhere between 24% and 64% since 2004. If it hits its guidance in its fiscal 4th quarter for 2010, which ends this month, it will report 34% growth for 2010. From 2005 and 2007, the company's growth rate was nearly cut in half, from 64% to 33%, before the recession began. While many are expecting lower growth in 2011, Wall Street hasn't treated the stock well when its growth rate has slowed. From August 2007 to March 2008, when growth was decelerating, but still over 20% year-over-year, the stock lost 58% of its value, a period during which NASDAQ fell just 15%. The current enterprise value/annualized earnings ratio of 41 is certainly high, but nothing like its obscene late 1999 valuation when the company was 96% smaller than it is now, generated nearly a quarter of its revenue from a soon-to-be-bankrupt Exodus, but had a market cap just 20% lower than today's soaring value. Moreover, many of the product lines it competed against then, such as Cisco/ArrowPoint, Nortel/Alteon/Radware, and Foundry/Brocade, are the same, yet have struggled amid mergers, acquisitions, and management focus on other product categories. So while the long term story for F5 continues to look very good, the sudden price drops that have accompanied its periods of slowing growth should make investors think twice before getting in at these levels.